Rabbi Levin's BIO | RabbiLevin.com - Fighting for Morality! Yehuda Levin, is a native New Yorker who is perhaps the best known Orthodox Rabbi in the Western world. He has been a special representative of the Union of Orthodox Rabbis of the United States and Canada and is a prominent figure in the Rabbinical Alliance of America, which has a membership of 1,200 rabbis and represents the views of more than 2 million Orthodox and traditional Jews all across the globe. He is often on television and radio, is a prolific writer, contributes regularly to his own website (RabbiLevin.com), and for a quarter of a century has been addressing the annual March For Life in Washington. (The event this year had an estimated 134,000 participants and was largely ignored by the major media.) Levin is known for his courage, optimism, and unflagging commitment to traditional Judeo-Christian moral values. 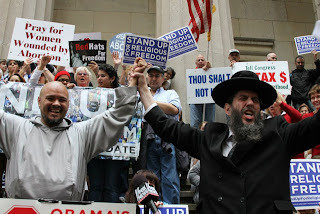 Like his friend Bill Donohue of the Catholic League, Rabbi Levin is someone a great many people on the Left detest. Most Jews in the United States are more or less secular. But Levin wants it known that Conservative Judaism is of the same stripe. When this branch of Judaism recently embraced homosexual clergy and homosexual marriage, Levin likened it to Catholics for a Free Choice. “That’s just paganism and apostasy, and the outrage of it all is that it’s in the name of a religion. So it has become very clear to many people that it is a pagan agenda.” The Rabbi does not mince words when serious principles are involved. Still, Levin is not dissatisfied with the recent elections that gave Democrats control of Congress. The GOP had the White House and Congress for six years, he states, and delivered only “lip service” when it came to family and life issues. Republicans, he believes, needed to be learn that their inaction had consequences.